Imagga will be taking part in WebSummit in Dublin at the end of October and we are excited of that opportunity to meet with lots of startups, interested investors and hackers from all over the world. We are working really hard and, fingers crossed, we will have some really exciting news to announce during the event. The Hardest Working Startup competition is one of the ways to raise awareness on the great startups that will be pitching and exhibiting at the event. The VIP treatment – plane tickets, transfer and hotel accommodation is just the top of the value proposition of that game. As we are busy working on what’s important the most – our image analysis technology, we will not be spending much time pushing you to like our page, so you have one chance, really. 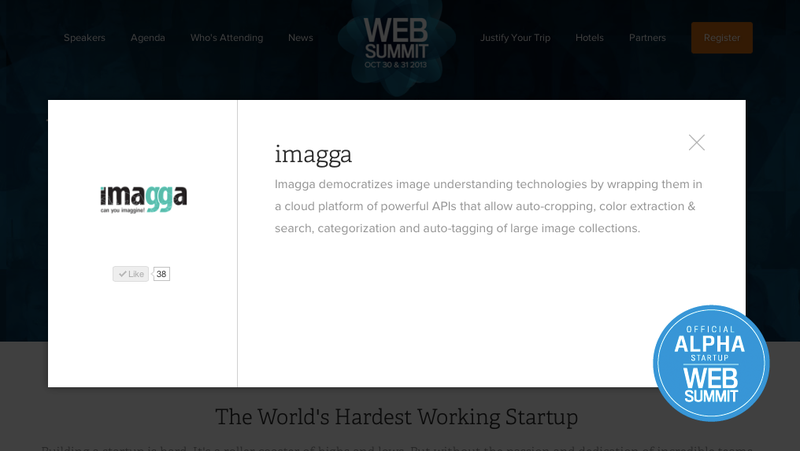 If you want to help, pls visit the specially designated Imagga WebSummit page, and press Like. What we will appreciate the most is if you follow us on Facebook, Twitter and possibly Angel List. Ah, and why not sing up for some of our great image APIs and hack with our service. Any feedback will be highly appreciated. If you happen to attend WebSummit, drop us a line in the comment box below and lets arrange a meeting to chat about images, SaaS, APIs, you name it!